Having a non-functional cartoon family consisting of yellow skin doesn’t sound like the most inspiring show to ever exist; however that same set of characters has shaped the last umpteen years of my life. Ever since the first prime time season on television, to the hit song ‘Do The Bart Man’ and now The Simpsons Movie, it is hard not to be influenced by one of the biggest and most celebrated television shows of all time. This isn’t the first game to tie in The Simpsons in the hope of vast revenue returns, but for the first time, you can feel the love the developers, story writers and whoever else was involved to make this not just stick out from the rest, but show how it should be done while slapping previous attempts in the face. It is extremely easy to dismiss any game that is branded with a popular series, but hold the press, there is actually something very precious here! Yes I know, almost shatters our belief in poor rip offs doesn’t it, however take a breather, find that buttocks indent in your gaming sofa and read the rest of this review to find out more. First off this is a 3D platformer with many twists that keep your attention span running for quite a while to come. Platformers can easily be dismissed nowadays as almost old fashioned and not worthy of our attention, but don’t fall into the trap of what was then and what is now. The Simpsons achieves enough happening to keep you going. 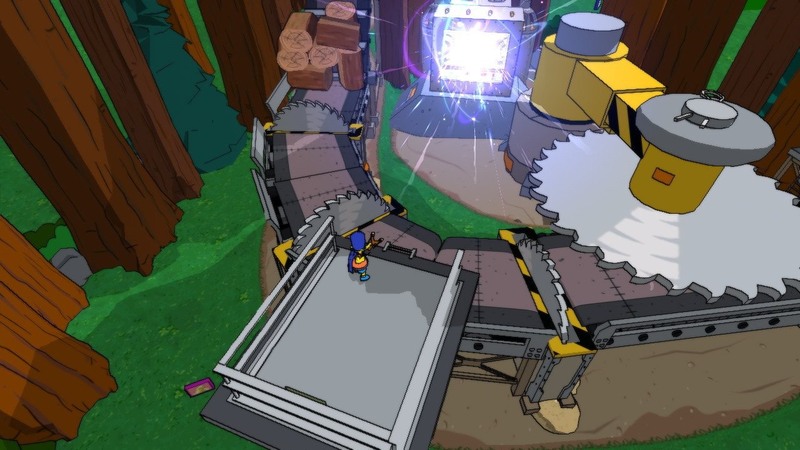 As with any 3D platformer, jumping around, picking up items, rotating the camera angle and pulling switches are all here, but you can’t help but get caught up in the whole Simpsons vibe throughout the game. Maybe if it was based on anything else, you might be turned off by it all in an instant, but perseverance does bring its reward. 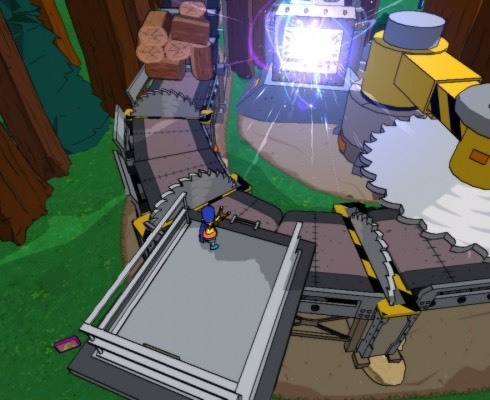 It is important to note, that the Simpsons realise fairly early on that they are actually within a computer game and will naturally have powers that can be used to complete the insane levels. Each character in the Simpsons family has special abilities. Homer can turn into a rolling ball, useful for speeding up ramps and also a green blob that fires goo at the enemies. Bart turns into the ‘Bartman’ (well it was going to be that or El Barto I guess! ), allowing you to grapple and climb walls. Lisa can use her Buda powers to lift huge objects, flick enemies and cause all kind of godly destruction down below, which can also be used to solve puzzles. 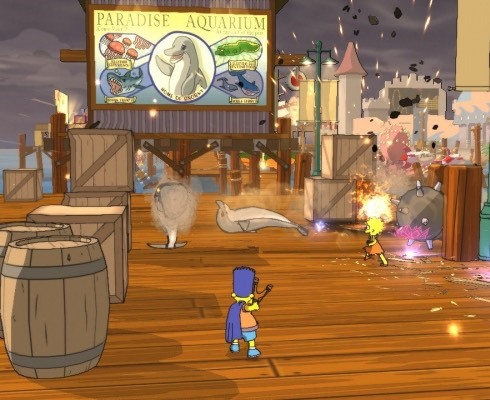 Marge can mass roaming characters into an angry mob to destroy or create objects. Even Maggie (who rests on Marge’s back) can be used to travel through small holes to press buttons. There are power ups as well for each character, which gives you invincibility and extras, but these are very short lasting. Starting in the Land of Chocolate, Homer is dreaming of course and has to follow the white chocolate rabbit. This is basically a tutorial in how to use this title and have a few laughs along the way. The premise is, Grand Theft Scratchy has just been released in Springfield and of course people like Marge Simpson are totally against this sort of violence in a virtual world. So ironically in this virtual world, you are left to sort this sorry situation out. Meeting many of your favourite characters in a rather large version of Springfield where you can explore the Simpsons house, Krusty Burger and all manner of locations that you will fondly remember. It is not all 3D platforming though, oh no! There are times when we step back to gaming nostalgia and clones of classics (with a Simpsons twist of course!) such as Joust and Gauntlet appear. Cell shaded graphics are not something new, but rarely have they looked so fantastically impressive and more importantly befitting their 3D character counterparts. 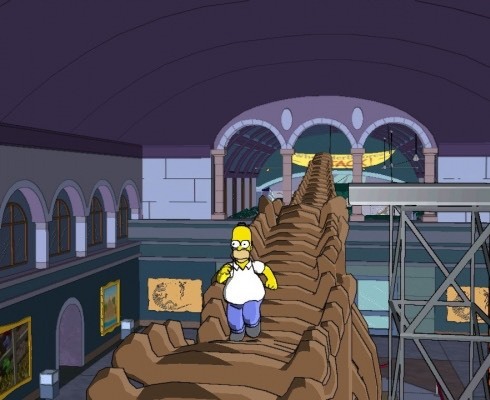 There are cut scene close ups of the 3D characters, which does spoil the illusion as it just doesn’t look quite right, but when you are controlling them through the theme inspired levels, you can’t help but feel the Simpsons love. The video cut scenes that help explain the barmy story look absolutely stunning in High Definition (and also widescreen!) and reminds me that the Simpsons Movie is out only on Blu-ray grrrrr. Bloody format wars, but never mind I digress. The music is superb throughout, but it is the actual voice actors from the show that bring life to this title. So many characters feature all with the original cast featuring and to my amazement even extras like Sideshow Bob makes an appearance… This is certainly worthy of a Mr Burns “Excellent!”. Some of the gags while you are running around solving puzzles do repeat themselves, which is a shame, however all in all the audio experience does add up to be extremely Simpsons faithful. Very important in a game based on a series. On completing the game, there are many items that can be collected to unlock further achievements. These include the video game ‘cliches’, that basically means when you find something that reeks of gaming heritage (good or bad), you unlock one of the clichÃ©s. This can include using pressure pads to enemies re-appearing in a later level, but with different colours. A nice twist that Comic Book Guy presents (who better come on?). There are also items to find that each character has to collect to unlock minor rewards. 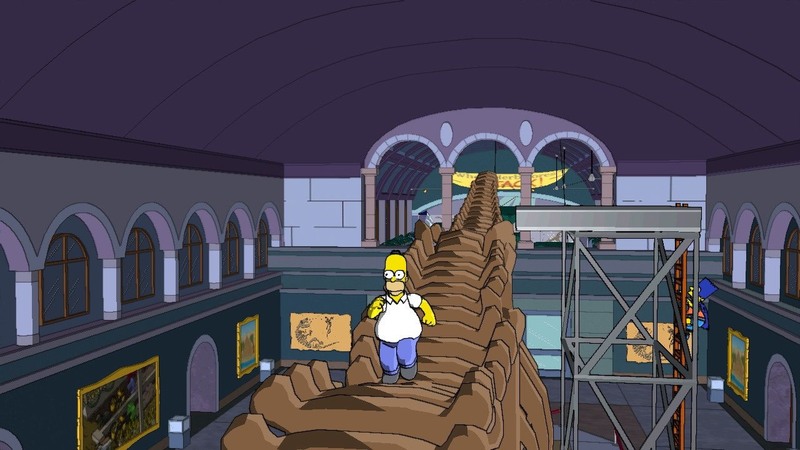 These are within the levels themselves and also within Springfield, so will add many hours if you want to collect them all, but really this is the biggest clichÃ© of them all and will only fascinate the minority. You can also complete time related tasks on most of the levels, which are unlocked on completion of that said level, but again these are like little stocking fillers and are not going to take up much of your time. One of the biggest downfalls is the obvious missing 2 player co-operative online feature over Xbox Live. You can play almost all of the game in split screen with a friend over, but what would seem to be a perfect fit for online play has been totally left out. Barmy! 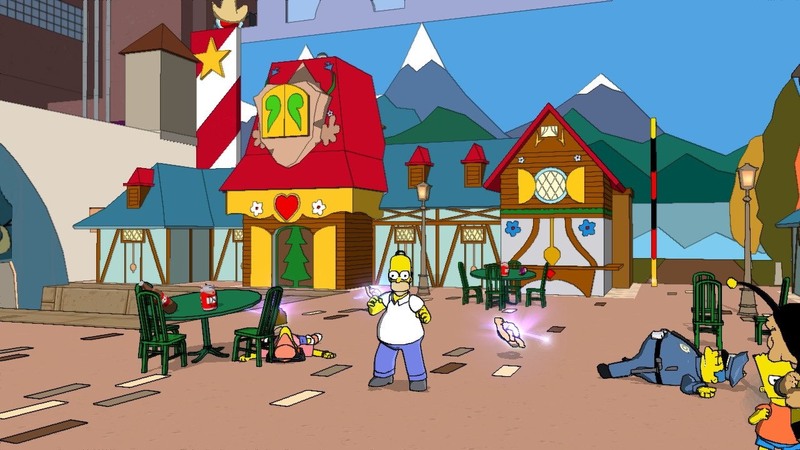 Finally breaking the mould, the Simpsons game, which isn’t based on the movie and all credit to the developers for that decision and not rushing to get the game out along with it has been a bold and better move, has taken my Simpsons delights into the gaming world successfully for the first time. It is not a groundbreaking 3D platformer, but it should be credited with the honours it does deserve, such as its faithfulness to the actual cartoon series, all the voice talents are present for the characters and gameplay is very satisfying, especially if you miss some of the more jump, double jump and glide abilities in modern gaming. 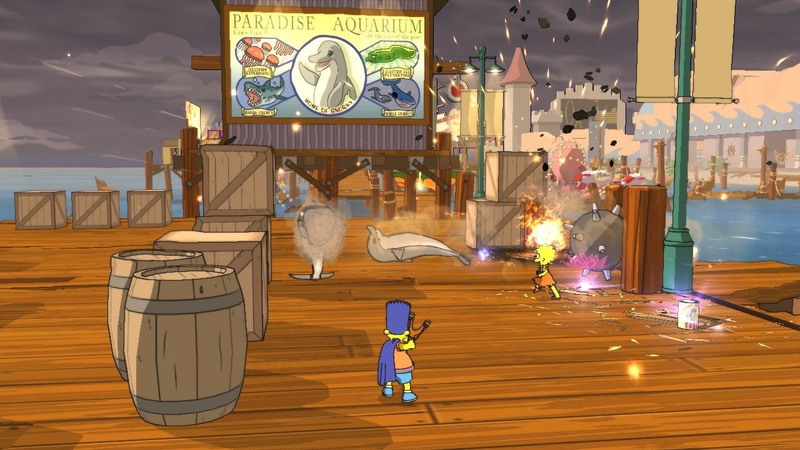 It may not be perfect, but The Simpsons Game is bold enough and packs enough gags to have you rolling along the floor either as Homer, or yourself as you constantly can’t believe the superb visuals and cut scenes. 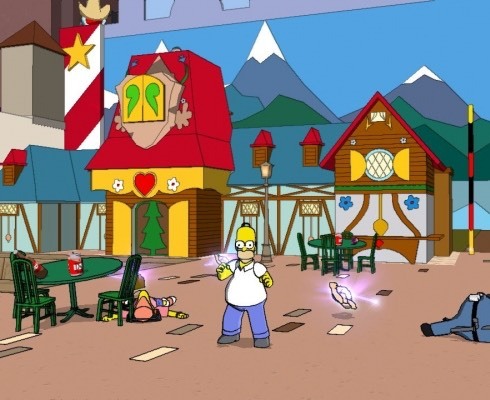 It doesn’t hold too much replay value unless you like collecting every item available, but it does enough to be easily the best Simpsons game I have ever played.